Government Camp, OR – The hazy, hot and humid days of summer are here, and there are many ways to cool off. You could head to the mountains to camp in cooler and drier air. Maybe you’ll venture to the beach for a dip in the ocean, or hang out by the pool with a piña colada in hand. Some folks beat the heat another way: they’re going skiing. Mount Hood, reflected in Oregon’s Trillium Lake. 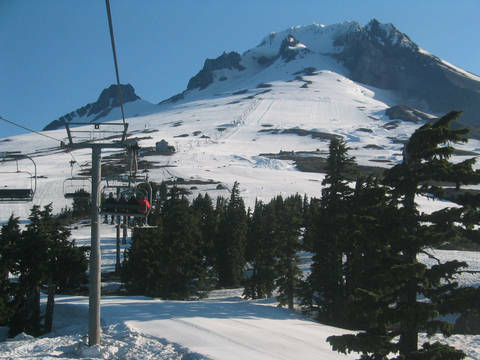 Since the early 1980s Timberline Resort on Oregon’s Mount Hood has fired up a chairlift on the Palmer Snowfield, a permanent pseudo-glacier on the mountain’s southern slopes for summer skiers and snowboarders. During the months of June, July and August, the mountain is teeming with young ski racers slapping gates and snowboarders going big amongst a massive collection of terrain park hits. Mount Hood rises abruptly to a lofty elevation of 11,239 feet above the coastal lowlands of western Oregon, the dormant volcano’s distinct white cone easily visible on a clear day from downtown Portland located some 50 miles to the west. All winter long, intense storms roll off the Pacific Ocean and plaster the above-treeline slopes of Mount Hood with snow, wind and cold. During the winter months, lift-served skiing at Timberline is relegated to lifts and trails below treeline, but once winter eases into spring and the storms subside, resort officials open the Magic Mile and Palmer chairlifts, a pair of detachable quads rising above the venerable Timberline Lodge to access the Palmer Snowfield. Timberline is the only year-round lift-served ski area in North America, closing only for two weeks of maintenance each September. Summer skiing hours begin at 7 a.m. and end at 1:30 p.m. or earlier, depending upon the time of year. Slopes are groomed and salted overnight, and during our late-June visit were rock hard for the first few hours before gradually softening into corn perfection by mid morning. As we pulled into the parking lot just after the 7 a.m. bell, the resort’s Wy’East Lodge, named for how the Multnomah Tribe of Native Americans refer to Mount Hood, was already buzzing with young ski racing hopefuls as the distinctive scent of fluoro wax permeated the hallways. Invicta ski bags were emptied and lockers filled. It was hard to comprehend that we were in the third week of June, for it looked…and felt…like any ski team’s club room at countless ski areas across the United States in the middle of winter. There were solitary types on the mountain, too. As we rode our first chair we squinted to observe a steady stream of climbers ascending the White River Glacier above the lifts, past the Steel Cliff and Crater Rock, the remnants of a lava dome from Mt. Hood’s last known eruption in the 1790s, to reach the summit via the Coalman Glacier. Such an undertaking requires extensive knowledge of rope, crampon and ice axe use as well as crevasse rescue techniques. As single-day visitors we were content to instead lap the two chairlifts as much as possible in the six and a half hours allotted to us. The Magic Mile chairlift ascends from the Timberline Lodge at 6,000 feet to the site of the Silcox Hut at 7,016 feet, an alternative “out of the way” lodging for visitors brought to the site by snowcat. While the snow cover here eventually melts out as the summer wears on, the lower-angle pitch and lower elevation allowed the East Mile and West Mile runs to soften in advance of their higher-elevation counterparts on Palmer. We therefore spent the first few hours of the day primarily lapping Magic Mile, carving broad arcs on the wide open expanses of perfect corduroy. Views on clear days are punctuated only by other Cascade volcanoes. Mount Jefferson rises in the distance, seemingly from the roof of Timberline Lodge. The Sisters adorn the horizon beyond. Deep runnels in the mountain’s topography hold snow up to 20 feet deep, enhanced during the winter months by snowcat grooming efforts to hold the snow in place. on any given summer day. By 9:30 a.m. Palmer was ready, and we ascended to 8,540 feet to try our hand at the higher terrain. Timberline’s terrain is decidedly intermediate in nature, and while Palmer is somewhat steeper than the low-angle runs off Magic Mile, nothing will give a strong intermediate any pause, and other than the increased pitch it’s simply more of the same: broad fields of groomed corduroy. Palmer Snowfield is divided in summer into pre-defined lanes for skiing and snowboarding. The lane earmarked for the public is closest to the lift, and stretching from the chairlift to the ski area boundary on either side across Bean’s Run and Outer West are 18 lanes sporting courses set up for ski and snowboard racers participating in over 20 different teams and camps to practice their art. During the high season, which ranges from early- to mid-summer, there are approximately 15 different additional training areas, four camp terrain parks including boardercross courses, and eight camp halfpipes. We found only approximately half of the lanes in use at any one time during our visit, and encountered no resistance to using these runs ourselves for freeskiing when not otherwise occupied by campers. The lower half of Palmer’s east side is devoted to the single largest collection of terrain park features that I’ve ever observed. 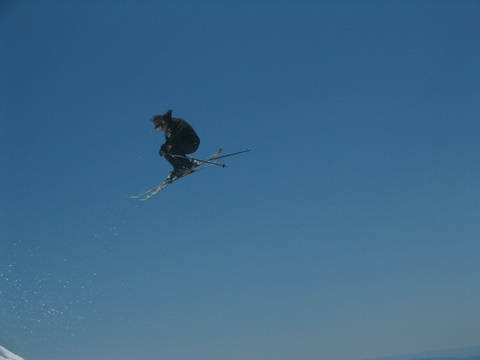 It’s reserved for freeride ski and snowboard camps such as Windells and High Cascade, as well as special events such as Burton’s Abominable Snow Jam and the Chevrolet Revolution Tour, so a public terrain park is also established below Silcox Hut on Otto Lang with a more modest set of hits. By late morning the ski racers headed off to whitewater raft, windsurf in the Columbia River Gorge at nearby Hood River, play paintball or hike, only to be replaced by the snowboard campers. Palmer Snowfield thus became our own private playground for carving big, broad high-speed turns without the hindrance of row upon row of gates. 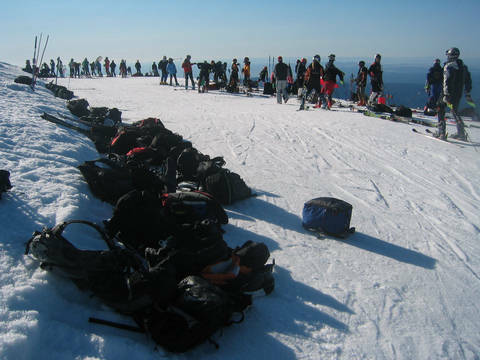 Windells and High Cascade alone bring over 2,000 campers to Mount Hood each summer from homes as far-flung as Japan, France, Italy and Canada. Camp prices range from $700 to $2,000 for a session lasting five to 10 days. Only a few of those skiing or boarding the Palmer Snowfield in summer are members of the general public, for Timberline officials have curtailed advertising to stem overcrowding on the snowfield’s slopes which see 1,200 to 1,500 skiers and riders on a busy summer day. We truly found elbow room, though, beyond Outer West and beyond the ski area boundary, where countless acres of suncupped corn awaited. After spending a morning surrounded by race campers and coaches, our turns out of bounds were a delightful and peaceful respite from the cramped and confined pre-defined lanes on Palmer. The Timberline Lodge, a registered National Historic Landmark that served as Stephen King’s vision of the “Overlook Hotel” for the 1980 film The Shining starring Jack Nicholson and Shelley Duvall, was finished in 1938 as one of the numerous Works Progress Administration (WPA) projects across the United States to provide employment during the Great Depression. The Kohnstamm family has operated the hotel and ski resort since 1955.
boom in the United States. He built one of Oregon’s first ski resorts to surround the lodge, and after passing away this past April at the age of 80 his family continues to run Timberline Resort. The Kohnstamm family is currently on its third lease term with the U.S. Forest Service to operate Timberline, due to expire in the year 2022. Lodge walls are adorned with Native American-inspired textiles, and artistic touches abound throughout. 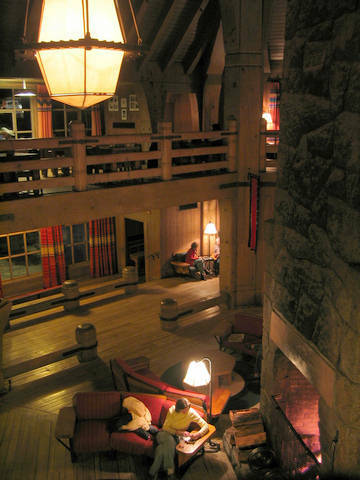 The central hall is a large two-story atrium surrounding a giant, welcoming four-sided stone fireplace. The Cascade Dining Room serves gourmet Pacific Northwest cuisine coupled with an award-winning wine list featuring landmark Pinot Noirs from many of the region’s vaunted vintners. More casual dining options are available in the Lodge’s Ram’s Head and Blue Ox bars. Day visitors will find traditional ski area fare in the cafeteria and Market Café, both located in the Wy’East Day Lodge. The nearby town of Government Camp, as well as the villages en route along the drive from Portland, suffers from a notably lacking bed base for destination visitors. One exception is the Mount Hood Inn right in the center of Government Camp, which also offers the Mt. Hood Brewing Company brewpub for hungry and thirsty visitors. Elsewhere in town, Charlie’s Mountain View and the Ratskellar cater to locals and weekend skiers. Visitors arrive at Timberline Lodge via a snaking access road that ascends from the village of Government Camp. There was a time, though, when the two were connected via aerial tramway and the Glade Ski Trail that deposited skiers upon the slopes of The Summit Ski Area, across the street from Mt. Hood Ski Bowl in Government Camp. Plans are afoot to offer a combined lift ticket between the two ski resorts this coming winter. Long-range plans may include a reopening of the Glade Ski Trail to connect the two. A new ski lift has also been permitted to open between Timberline’s existing Stormin’ Norman and Pucci lifts. For now, though, even without the new developments, Timberline offers a unique way for skiers and riders to extend their season and beat the summer heat. Going big in Timberline’s summer terrain park. Regional Lodging Information: The Mt. 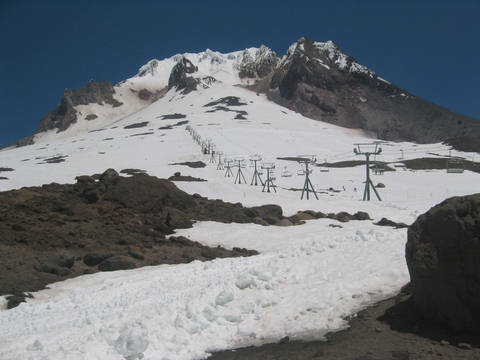 Hood Information Center at www.mthood.info or 888-622-4822. 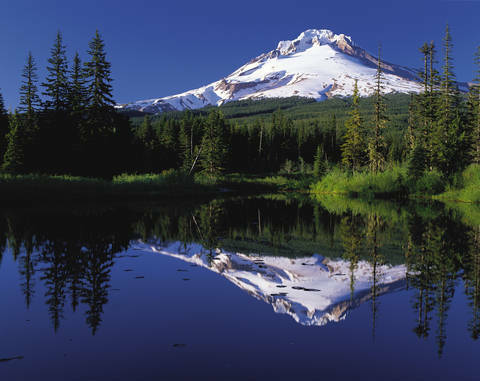 Camping: Trillium Lake, Tollgate, Clear Lake, Still Creek, Camp Creek, and Timothy Lake are all U.S. Forest Service campgrounds within a one-hour drive. Contact the U.S. Forest Service Zig Zag Station for more information at (503) 622-3191 of visit the Mt. Hood National Forest website at http://www.fs.fed.us/r6/mthood/.